The world's biggest plane's wingspan measures longer than a football field. (CNN) After years of development in the desert north of Los Angeles, a gigantic, six-engined mega jet with the wingspan of an American football field flew Saturday morning for the first time. "We finally did it," said Stratolaunch Systems CEO Jean Floyd at a news conference from the hangar at Mojave Air & Space Port. "It was an emotional moment to watch this bird take flight." 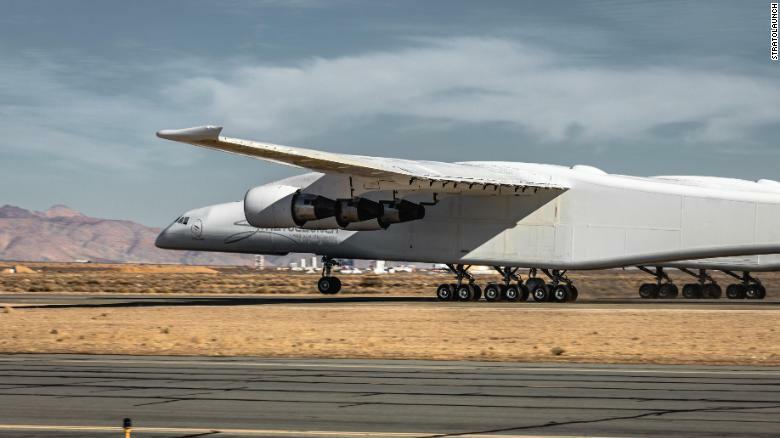 Stratolaunch, the company founded in 2011 by the late Microsoft co-founder Paul Allen, conducted the first test flight of the world's largest plane. "I had imagined this moment for years, but I had never imagined it without Paul standing next to me," Floyd said, adding that he whispered a private "thank-you" to Allen as the plane took flight. Allen died last October at age 65 from complications related to non-Hodgkin's lymphoma. In simple terms, the Stratolaunch aircraft is a giant flying launch pad, designed to hurtle satellites into low Earth orbit. It aims to offer the military, private companies and even NASA itself a more economical way to get into space. The company's business model calls for getting satellites into space "as easy as booking an airline flight." Test pilot Evan Thomas flew the jet to speeds of about 173 mph, climbing as high as 15,000 feet before returning smoothly and safely back, after a nearly two-and-a-half-hour flight. "For the most part, the plane flew as predicted," said Thomas, a former F-16 Air Force fighter pilot. "It was overall fantastic. I honestly could not have hoped for more on a first flight, especially of an airplane of this complexity and this uniqueness." "It's the world's biggest airplane. It's so huge, it seems like it shouldn't be able to fly," Jack Beyer, an aerospace and launch photographer for NASASpaceFlight.com, told CNN on Thursday. He's excited to witness the beginnings of the space industry's rising trend: using jets to launch satellites. Dozens of photographers, industry bloggers and aerospace enthusiasts gathered this week to glimpse the unique twin-fuselage plane. "People are interested in the first flight of Stratolaunch because they want to see the future," Beyer said. "It's the same reason why people tune in each year to watch the Apple keynotes. People want to see what's next." Here's how Stratolaunch is supposed to work once the plane is fully tested and certified: The jet, carrying a rocket loaded with a satellite, will take off from Mojave and climb to an altitude of 35,000 feet. There, pilots will launch the rocket from the plane on a trajectory toward space. The plane then will land safety back at Mojave, while the rocket carries the satellite into an orbit ranging from about 300 miles to 1,200 miles above Earth. The rocket deploys the satellite before eventually falling back to Earth, burning up in the sky like a meteor. Although the cost of the airplane hasn't been made public, other details are known. To make it both strong and lightweight, Stratolaunch is made largely of carbon fiber material instead of aluminum. To save money on designing new engines and landing gear, the jet is powered by six Pratt & Whitney engines, which were originally designed for Boeing 747s. Its landing gear, which includes a mind-boggling 28 wheels, was also first designed for 747s. Satellites in low Earth orbit can provide communications and broadband internet connectivity to remote areas on the ground. They can conduct valuable Earth observation and surveillance. The market for commercial satellite launch services is growing rapidly and is expected to reach $7 billion by 2024, according to Global Market Insights. Putting small satellites into space via airplanes also promises to be cheaper than traditional rocket launches because it eliminates the need for launch pads and all the pricey equipment and infrastructure surrounding a traditional rocket launch. It also can save on fuel costs, because the plane burns less fuel than a traditional rocket when it blasts off from Earth. Other benefits: Bad weather won't be as much of a problem. Storms can delay a traditional rocket launch, but a jet could simply take off and fly over bad weather -- or around it -- and then launch the satellite. Launches could take place more frequently and within a faster time frame. No more waiting in line for a slot to open up on a spacecraft blasting off from a traditional terrestrial launch pad. Though Stratolaunch has only flown once, it's already facing competition from billionaire Richard Branson and his Virgin Orbit company. Its LauncherOne service wants to fling rockets carrying satellites into orbit from a customized Boeing 747-400 -- which, unlike Stratolaunch, is a proven aircraft. 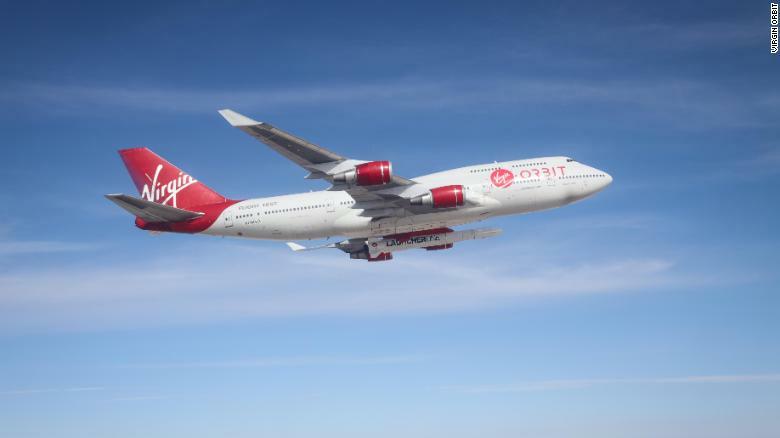 Virgin Orbit plans to conduct its first launch at Mojave Air & Space Port sometime "in the middle of the year." "We are well on our way towards providing new launch opportunities for small satellites that have waited too long for their ride to space," Virgin Orbit CEO Dan Hart said Wednesday in a statement. Virgin Orbit plans to use a customized Boeing 747-400 to compete with Stratolaunch. Stratolaunch pops a wheelie during January's high-speed taxi test. Stratolaunch's first flight presents the company with a new set of hoops to jump through before it can start doing business. Pilots will have to test fly the jet many more times before it can be checked and certified by the Federal Aviation Administration. If all goes as planned, Stratolaunch said the plane is expected to launch its first satellite sometime next year.